This article was written by Global Graduates, published on 20th May 2012 and has been read 3975 times. 1. The weather was temperamental when I arrived in Japan in September, going from blazingly hot and humid to several consecutive days of drizzle, then back again. It struck me that it reflected my moods, swaying between giddy overexcitement and pangs of homesickness. This photo, taken in those first few weeks, shows the different weathers coming together to create a beautiful technicolour rainbow, which I like to think reflects the real happiness I've found here. 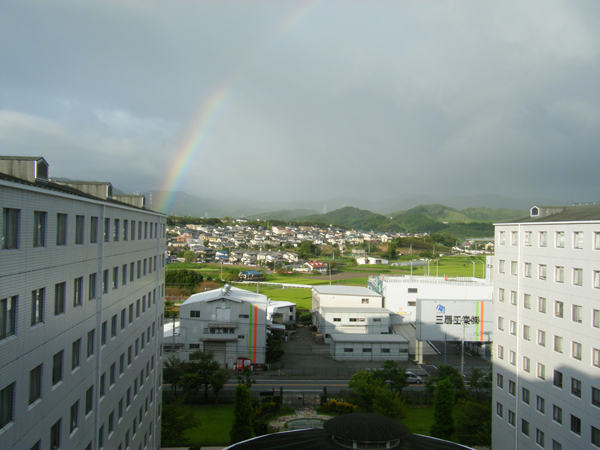 This view from my bedroom window is also a snapshot of the different urban and natural landscapes Japan offers. The tree covered mountains rise without warning from the planes which hold the neat, lovingly-tended paddy fields. Practical, industrial factories cosy-up with high rise, regimented apartment blocks whilst patches of beautiful, Japanese style houses lie in peace away from the main roads. 2. I like the self-conscious adoption of traditional Japanese culture portrayed here, as the girl listens to instructions from the photographer on how to hold her fan properly. I’ve found people here to be very proud of what they consider to be uniquely Japanese. It can be funny when you, a foreigner, are marvelled at because you ‘can’ eat Japanese food- and with chop sticks to boot. But I've also found it quite touching how many traditions are openly preserved just for the fun of it and there has never been a shortage of willing volunteers to explain and demonstrate everything from tea-ceremony to origami. 3. Following on nicely from the last photo, here’s a shot from a festival in a local shrine that has small bags of dried beans and sweets thrown to the crowds that have eagerly gathered. What exactly this festival celebrates, I never did work out. It was a wonderfully mad experience and combined all that is great about Japanese politeness- the crowd ensured everyone had at least one bag each- with an unusual childish zeal from a normally fairly reserved people. And, of course, the ubiquitous face mask makes an appearance. 5. My single favourite street in Japan leading to Dazaifu shrine. It contains some beautiful, traditional restaurants complete with tatami mats and gardens at the back. You can buy great souvenirs (because let’s not pretend this isn’t just a year-long holiday really!) and, bizarrely, a brilliantly designed Starbucks – google “Dazaifu Starbucks,” it turns out it’s quite famous. The street leads to a huge, bustling Shinto shrine in one direction and in the other a very peaceful Zen garden tucked away behind a temple. Many a pleasant afternoon has been whiled away here.